View More In Scanner Accessories. 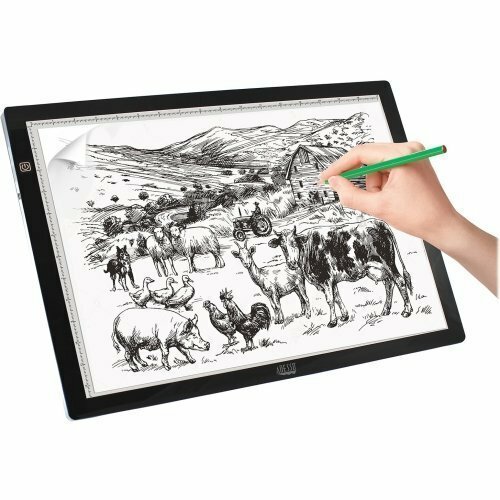 The Adesso CyberPad P2 12" x 17" LED Light Tracing Pad offers more working surface area than the CyberPad P1. It is ideal for users creating larger size artworks that need more space. It also has the flicker-free LED lighting technology ensuring even lighting across the board for eye protection. Just like the CyberPad P1, the CyberPad P2 has a wide range of applications. Medically, doctors can use it view large or small size x-ray fillms. Educationally, children and beginning artists can learn how to draw and trace. Professionally, architects and designers can create their work with precision with the built in rulers on the sides. If you have any questions about this product by Adesso, contact us by completing and submitting the form below. If you are looking for a specif part number, please include it with your message.